Usually found near the coast forming thickets on fixed dunes and sea cliffs. Sea-buckthorn shrubs can reach 0,5 - 6 m in height and 25 cm in diameter. In western Europe, it is largely confined to Atlantic coast. Plants are tolerant of salt in the air and soil so they typically occur in dry, sandy areas. In central Europe and Asia it also occurs as a subalpine shrub above tree line high in the mountains. The fruit is orange berry-like 6–9 mm in diameter, soft, juicy and rich in oils. Sea buckthorn has been used for over a thousand years in China as a food and a medicinal plant. 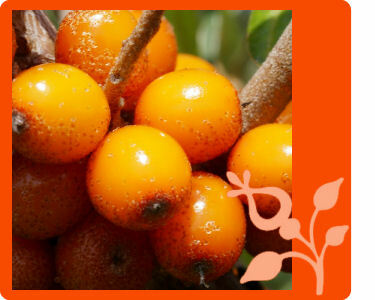 Sea-buckthorn berries are edible and nutritious, though very acidic and unpleasant to eat raw. The high vitamin C content (695 mg per 100 grams) makes sea-buckthorn berries a rich source of vitamin C. The berries also contain vitamin E, flavanols and other polyphenols. Sea-buckthorn oil from sea-buckthorn seeds and fruit differ considerably in fatty acid composition. Sea-buckthorn fruit oil is rich in omega-3, omega-6, omega-7 and omega-9 fatty acids. Sea-buckthorn berries are used to make sweets, jams, juices and liquors. sea buckthorn fruit oil - obtained from the whole sea buckthorn berry, usually reddish-brown. Oil produced from the fruit of sea buckthorn and used in the treatment of cardiac disorders. The sea buckthorn oil has a healing and analgesic properties, It is used for the treatment of psoriasis. Cold pressed sea buckthorn oil is sold for use as a dietary supplements to help improve conditions of dry and delicate mucous membranes. protect them from solar radiation (3). One reason for the increase in sea buckthorn berries use in cosmetics is the recent upswing of consumers who are interested in natural cosmetics. The sea buckthorn oil is used to prepare nutritious masks, which accelerate the epithelisation and regeneration of the skin tissue. The synergies between multiple bioactive compounds of sea buckthorn oil reduces physical and chemical irritation of skin. The search for natural antioxidants brought researchers to sea buckthorn since it high in vitamin C. Sea buckthorn has been described as rejuvenating and restorative, with reported ant aging benefits (2). Sea buckthorn seed oil contains a large amount of natural vitamin E and as powerful natural antioxidant. It softens and nourishes the skin without disrupting cell respiration of skin. Sea buckthorn oil moisturizes and rejuvenates the skin, removes the feeling of tightness, restoring skin elasticity and softness, prevents premature skin aging. Berry seeds are rich in oil which commonly contains essential omega 6 and omega 3 fatty acids. This unique fatty acid composition, in combination with high contents of oil antioxidants has in recent years made the sea buckthorn seed oil a valuable ingredient used in personal care and nutraceutical products. Ecouna AB (Swedish producer of natural cosmetics) produces Arctic Naturals - Sea Buckthorn Day Cream containing sea buckthorn oil. Sea buckthorn oils have tissue-regenerative effect and promote healing of skin burns and wounds. The leaf extract of the sea buckthorn containing tannins is applied with success in toning and firming skin lotions and tonics. Sea buckthorn leaf extract prevents hair loss and baldness, strengthens hair follicles. Burke DS, Smidt CR, Vuong LT (2005). "Momordica Cochinchinensis, Rosa Roxburghii, Wolfberry, and Sea Buckthorn - Highly nutritional fruits supported by tradition and science". Current Topics in Nutraceutical Research 3 (4): 259–266.